A few years ago I visited the Metropolitan Museum and saw an exhibit of British color linoleum prints from the 1920's. I was totally hooked. I wrote about the experience here. Since that time I have wanted TFWW to offer a class in linoleum block printing, but it's only recently that we have been able to put it together. Annie Raso, a NYC woodworking instructor and artist, will be teaching a Lino Block Printing class next month -- just in time to make holiday cards. Now I know that many people no longer mail actual paper holiday cards. I also know that a laser printer can print a fine custom card if you want to. But if you have any experience with traditional letter press, you know that the feel of a impression of a block print on a piece of paper is something special. For me, certainly one of the wonderful parts of collecting books, especially old books, is getting a certain physical evidence of printing. It just feels special. If you want to read more about my general enthusiasm for ink on paper printing - click here. There are two basic types of wood carving that are associated with printing. In both types you draw your image in reverse on the printing block. In relief printing, you carve your design by cutting away everything from a block (typically a block of soft wood) that you don't want in the print. Then you cover your block with ink, ideally using a roller or brayer, and only the flat surface of the block (that remains after you've removed what you don't want included) receives the ink. Paper is pressed onto the inked block to make a print. Technically this is very easy, and you can even use a raw half of a potato to do a print. 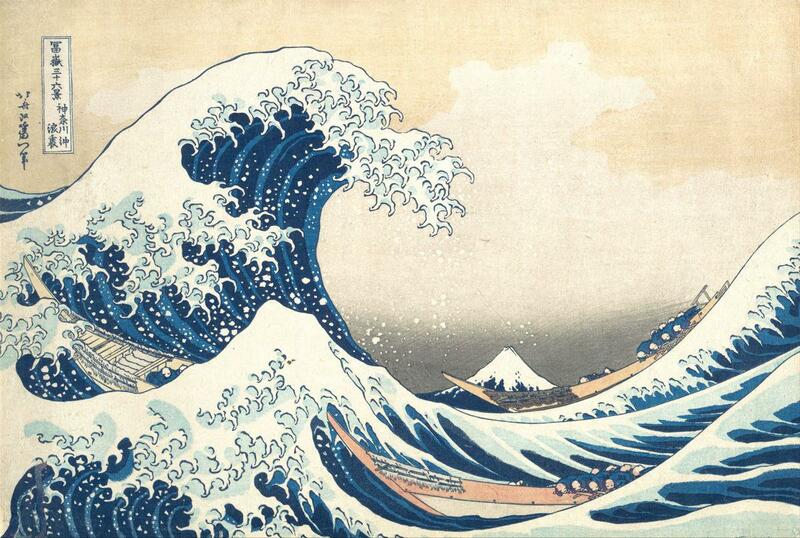 Wood blocks for relief printing can't really be used for very fine lines since the leftover surface would be very weak, but this type of printing is used on Japanese prints like Hokusai's Great Wave. Albrecht Durer made his fortune with them. 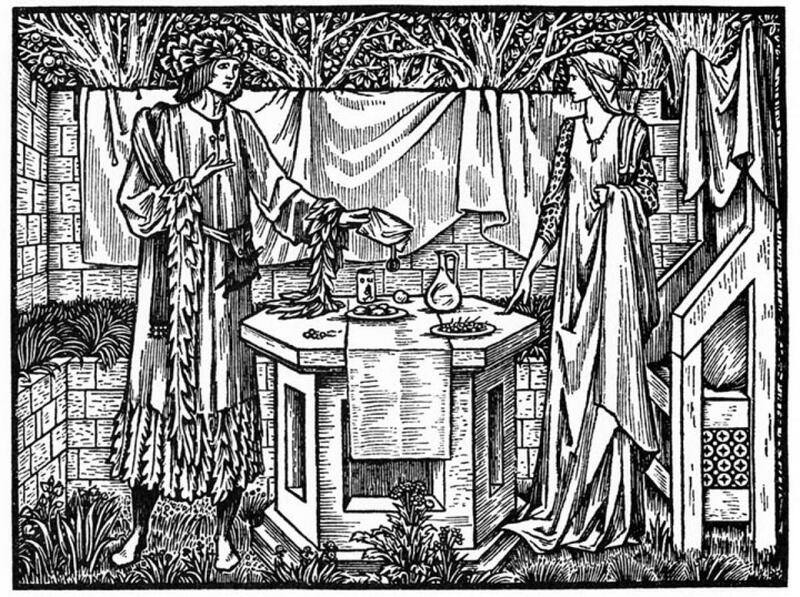 William Morris used big wooden relief blocks for wallpaper printing, and wooden type, especially for headlines, was commonly used. Regular book printing uses slugs of lead with letters on them is a relief process, so if you want to illustrate a book in letterpress you would use a wooden book carved in relief. More on this in a moment. The other type of printing is engraving, a process in which you carve the image rather than carving away the material that isn't being printed. Then you ink the entire block, wipe away any ink on the flat top of the block, leaving pockets of ink wherever you want to print. The use of an engraving press exerts a lot of pressure and forces the paper just below the surface of the block to pick up ink. This method is used to create fine lines in printing. 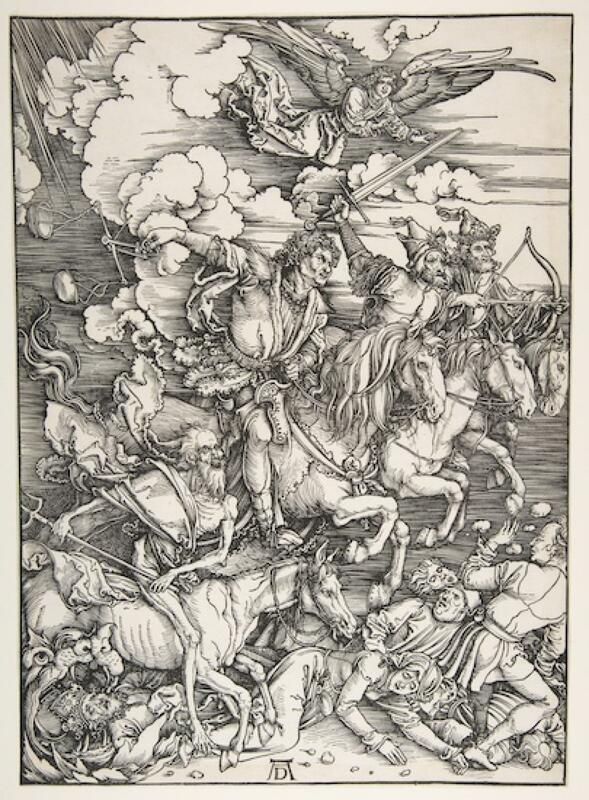 Durer used it for some of his works, but it is more expensive to reprint than other methods. Engraving also requires a very dense flat block. Most engraving is actually done on copper plates, not wooden boards for this reason. Whereas wood engraving requires a fancy engraving press and special tools, wood relief printing, in its basic form, needs very few tools. The big problem with wood relief printing is getting the right kind of block to print on. If there is unevenness in the grain of the wood - like pine - the grain high areas will pick up ink and print. Some artists use the wood grain as part of their design. Also, if the block warps because of wet ink, it could belly and no longer print flat. A soft wood that is pleasingly easy to carve has the downside of overall weakness: depending on the grain, wood can easily accidentally split off a bit of the design. Linoleum, invented in the 1850s when a manufacturer noticed the rubbery quality of solidified linseed oil, was the perfect solution. It has no grain and is impervious to moisture. So it is an inexpensive and easy to carve material. Relief carving uses regular, but small carving tools, usually bent not straight, and you only need a few to do a great job. Basically all you are doing is removing material accurately to a line, then wasting out the non-printing areas to get them lower so that they don't print. We've been selling Flexcut's set of linoleum printing tools for a long time - Annie's class will use them - because the set includes the tools you need to get started, and they are sharp and ready to use. Having interchangeable tools with one handle keeps the cost down which is also important. Another good choice are Ashley Iles block cutters. Incidentally all short carving tools that you use one handed with the handle tucked into your palm are called "Palm Tools" in the US. Ashley Iles calls them "Block Cutters" because up into fairly recently that's what they were mostly for. While the Flexcut set has exactly what you need to go from beginner to intermediate, as you get more practice the huge range of Ashley Iles Block cutters can open up a lot of opportunity. Of course lots of carvers prefer block cutters for general carving but that is another story. 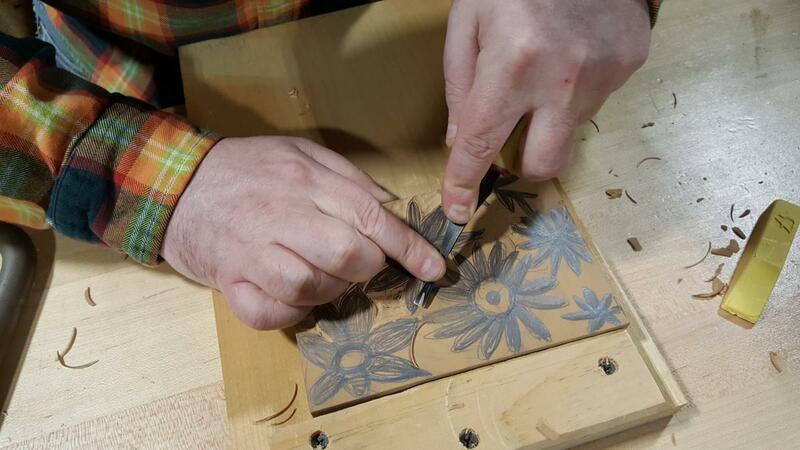 By the way, carving a block is one of those activities that you can easily do on your kitchen table. All you really need, aside from sharp tools, is a non-slip mat to keep your work in place. In the picture above I am just starting a block print of a cheerful pattern of flowers. I should take Annie's class and I bet I would do this more efficiently, but either way I am having a good time. What I am actually doing is outlining the patter with a narrow tool, and then I will remove the non-printing waste. Here is what you can do if you are REALLY good! Ar you aware the Met has at least two wood blocks that prints that Durer used to make his prints? Needless to say, they are astonishing to examine in person. Yes! I have seen one of them - they were on exhibit. I am shocked that they survived at all. We will be in Manhattan (from Philadelphia) this weekend. Are those two Durer blocks available to be seen now? If so, what section? Wow, a definite must see. Thank you. I think but I will not swear I saw it in this exhibit which is still on. In any case make sure you look at their drawing and prints collection on the second floor. Also the Chippendale exhibit (whicih I wrote about a few weeks ago) is still up I think. As I had some time at Narita airport in Tokyo, I had the opportunity to recreate The Katsushika Hokusai with traditional stamping methods. It was put on by one of Japan’s heritage groups. A lot of fun....but NO where near as the quality achieved by the artist. It does hang proudly though in my entrance way. Yes, The Martyrdom of Saint Catherine is currently on view in Gallery 521. Let's not forget M.C. Escher!!!!! !